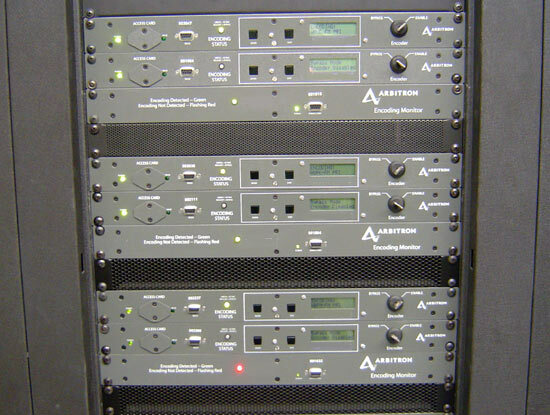 We have a few stations that are currently encoded with the Arbitron PPM encoders. I did a little research on the encoding method, since it is not immediately apparent how they are transmitting their data. According to Wikipedia, which can sometimes be relied upon, Arbitron used Martin Marietta to help develop the technology. Martin Marietta (now Lockheed Martin) is mostly known as a defense contractor, they have helped develop several complex military communications systems over the years. There are no fewer than 39 US patents that cover the technology used in the PPM. The most significant of these appears to be 7,316,025 which describes the psychoacoustic masking technique employed. It really is pretty slick, using a sample rate of 8.192 kHz, it transmits 4 bits per second in the 300-3000 Hz range by hitting specific frequencies in that range at varying intervals, adapting to the audio levels to keep the encoding below the programming content. 4 BPS is very slow and thus very robust. After all, I believe the only formation transmitted is a six digit encoder serial number. I did not read all 39 patents to see if anything else was changed in the encoding method, so it may be slightly different. This type of system would have fairly low overhead, not adding to the station’s bandwidth which is a consideration for FM stations, and in the correct frequency range for most AM receivers on the market today. Some people have said they have heard the encoding on one of our stations, most notably during silence or very quite programming. Perhaps, especially in a dead air situation, one might hear in nearly imperceptible low frequency slow fluttering sound. If anything, the encoding is perhaps too robust. Now for the deployment of the monitor technology, which has so many up in arms. As with other Arbitron ratings methods, the main bone of contention seems to be the size and distribution of the sampling hardware. Minority groups feel they are under represented because the PPM is unevenly distributed. Ratings samples always seem to skew one way or another. The data samples themselves seem to be too small to accurately predict a station’s listenership. One anomaly and the entire month or quarter can be thrown off. The PPM seems to correct some if the issues with keeping an accurate written diary. One problem with the PPM however, it can also pick up incidental background noise and count it as time spent listening (TSL). Think of the cubical environment where somebody several cubes away might be listening to a radio station. To the PPM wearer, it is unintelligible background noise, however, because of the perceptual encoding, the PPM picks it up and it counts as several hours of TSL. A broader sample would dilute this with other more accurate representations of radio listening. A broader sample would also alleviate some of the complaints from the Minority Media and Telecommunications Council (MMTC). First year physics students would recognize that not enough sample data can make results wildly inaccurate. Or, as one emergency room doctor stated while washing my knee out with a liter of sterile water after a dirt bike accident, the solution to pollution is dilution.